Bill Fick has "spread the gospel" of printmaking for years, and his enthusiasm for the visual arts will help grow community at the Ruby. When he isn’t methodically making monsters in his studio, Bill Fick (Trinity ‘86) is likely making it possible for other people to make art. As a lecturing fellow in the Department of Art, Art History, and Visual Studies, Fick teaches drawing, printmaking, and the art of comics and zines. 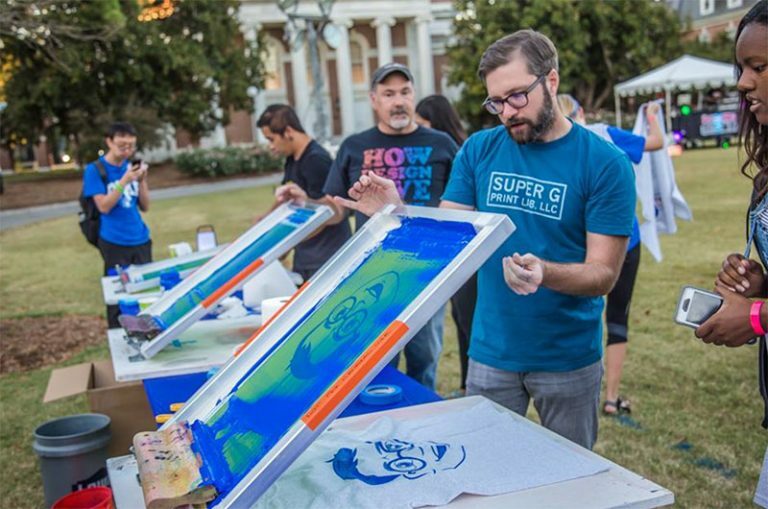 Outside the classroom, Fick oversees DukeCreate, a free weekly studio arts workshop series for students and staff and is co-owner of Supergraphic and Super G Print Labs, Durham print studios. After teaching studio art at Duke for more than a decade, Fick is now stepping into the role of assistant director for visual and studio arts at the Rubenstein Arts Center. Fick (center) in the Ruby's painting studio this October. Photo by Katy Clune. After graduation, Fick spent two semesters in Michigan studying furniture design before getting his MFA from the University of North Carolina-Greensboro in 1990. When he finished the program, he set up a studio in Greensboro and began to exhibit. After a few years, he moved to New York City, where he continued his work as a solo artist. He also founded Cockeyed Press (1995-2012), worked for a print dealer, and taught printmaking at Pratt. Fick has been steadily productive as a solo artist, and his work has appeared in shows across the US as well as in Canada, England, China, and Korea. Bill Fick, Smoking Skull, 2017. 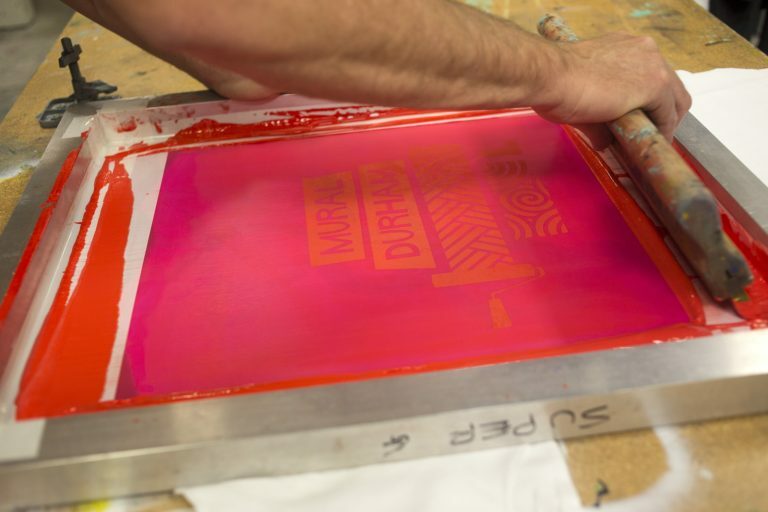 Speedball named an ink for Fick's Durham print studio, Supergraphic. Photo by Katy Clune. 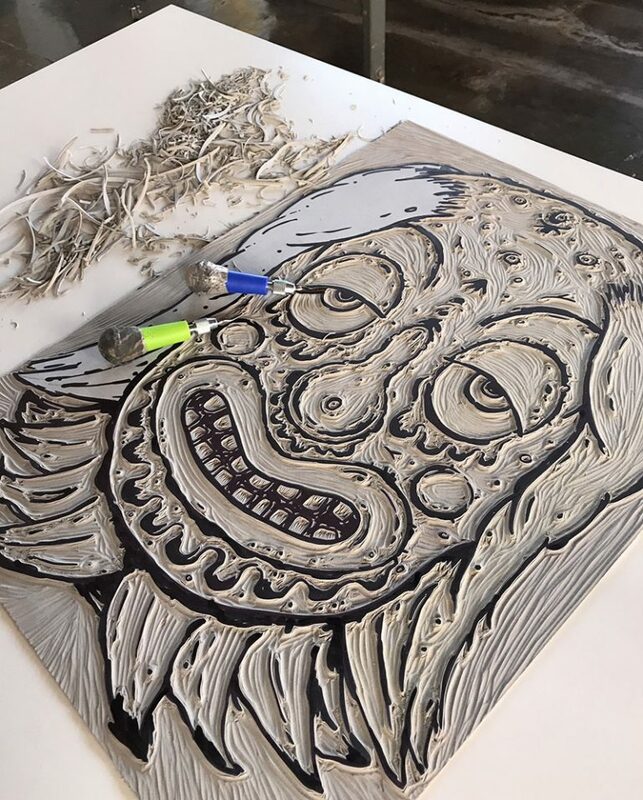 According to Fick’s Wikipedia page, he is part of the movement within contemporary American art known as “Outlaw Printmaking.” Fick specializes in a technique called linocut, in which non-printing areas are carved out of a block of linoleum with a gouge. The linoleum block is then inked, a sheet of paper is laid on top and then both are run through a press. One thing that struck Fick when he returned to North Carolina from New York City in 2004 was that printmakers needed more space to work in the Triangle. In response, in 2013, Fick opened Supergraphic in Durham to support other artists and to “spread the gospel of printmaking.” Speedball, an art materials company, has since worked with Fick to develop its “Supergraphic” Black professional relief printing ink. 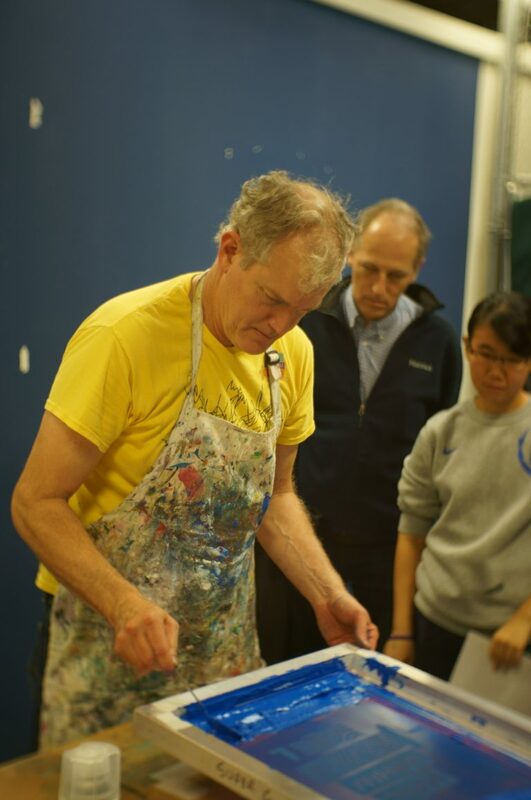 Watch a video of Fick’s process, produced Jim Havercamp, who teaches in Duke’s AMI program. Many of Fick’s prints feature demons and monsters. Despite the subject matter, there’s just nothing tortured or Gothic about him. Many of Fick’s prints feature demons and monsters. Despite the subject matter, there’s just nothing tortured or Gothic about him. His interests have always run to satire and socio-political commentary, to high-impact images that are open to interpretation, and to comic book imagery—a subject he regularly teaches. The East Main Street Supergraphics Labs location. Photo courtesy Supergraphics. Fick returned to Duke to teach in 2007 and two years later helped mount the first Duke Arts Festival in 2009. He quickly emerged as an instructor who could mobilize and inspire students to submit pieces for the festival’s signature event, the exhibition in the Bryan Center. In 2012, when an abandoned telecommunications facility was turned into the Arts Annex, Duke’s first dedicated space for student artists to create and rehearse, Fick’s input was critical. 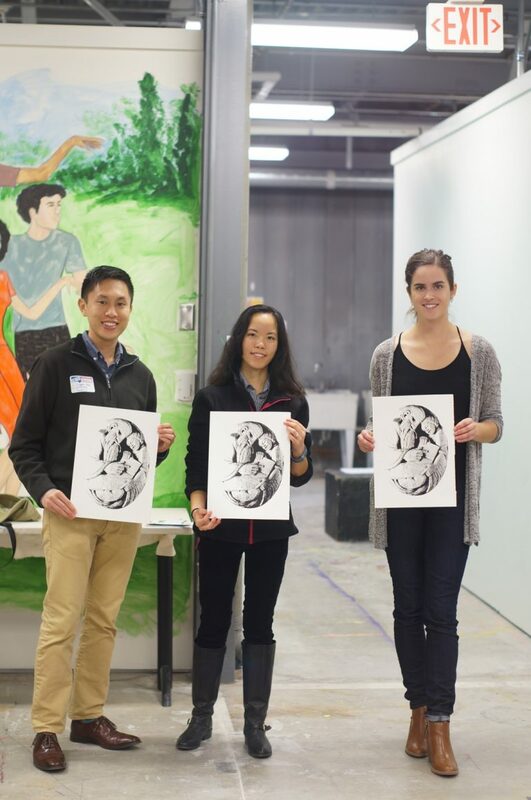 Fick, together with Amy Unell, director, arts engagement and partnerships, took quick advantage of the new community space to launch another major Duke Arts initiative, a weekly workshop series in studio and media arts called DukeCreate. Bill Fick screen printing a t-shirt with a student in the Bryan Center during the 2011 Duke Arts Festival. The success of the program, now in its third year, is a credit to Fick’s skill and vigilance as an organizer and also his ties to the community of artists in the Triangle. These are the attributes he brings to his role as assistant director of the Ruby, as well. Study in the visual arts—both creative practice and scholarly work—is no longer a fringe endeavor at Duke. The Rubenstein Arts Center represents the momentous changes at Duke from Fick’s student days. At the Ruby, Fick is hoping to increase opportunities for students to engage with, and learn from, visiting artists from the Triangle and beyond. 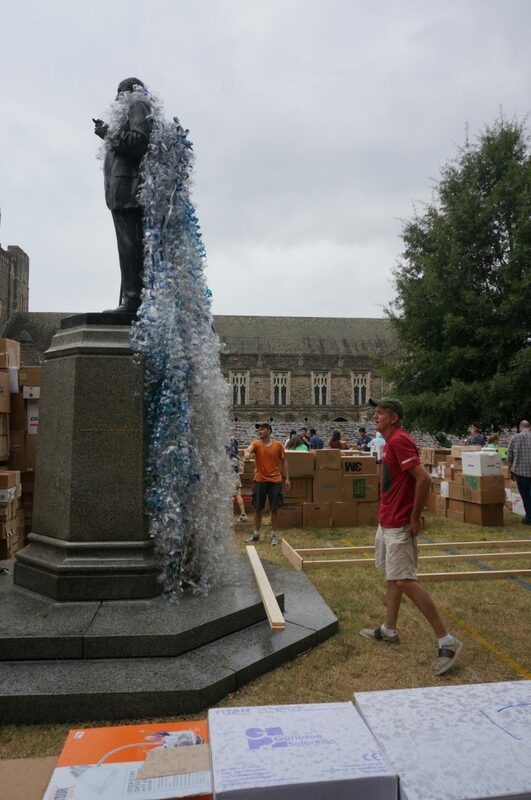 He’s also seeking ways to more strongly connect Duke Arts with Durham through partnerships with local community organizations like the Scrap Exchange. Study in the visual arts—both creative practice and scholarly work—is no longer a fringe endeavor at Duke. Thanks in part to Fick’s work in and out of the classroom, there is much more support for students to dive deep into their medium of choice, hone their skills to a professional level, and to develop their own body of work.